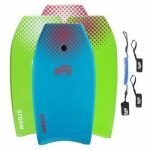 Browsing the best body boards on the market will expose you to an invasion of models and brands. It will be difficult to find out which one is really the best out there. Finding something specifically built for your unique needs is not as simple as it seems. 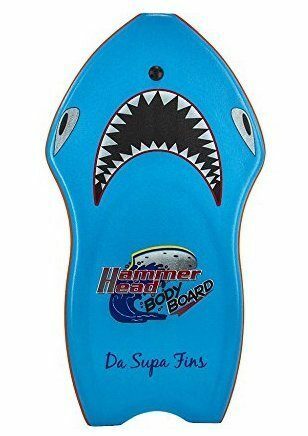 Luckily for you, we have researched and put together a guide on the top 10 body boards in the market today. Light, weighs 4.2 pounds only. Can easily take up to 180 pounds in weight. Speedy and easy to maneuver. Featuring a solid warranty and available in a few different colors, Morey Mach 7 is currently a leading board for adults. 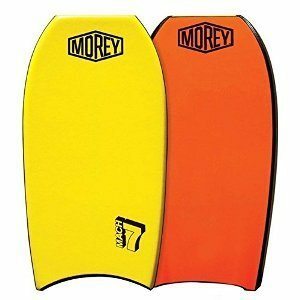 It's part of a wider generation of well rated Morey bodyboards, yet it stands up in the crowd through its unique features. Morey's Mach 7 body board is 42 inches long. It's a standard size for most adults. It can easily go between the knees and chin, yet it might feel a bit too long for short people. When it comes to its actual width, it goes up to 22.25 inches. It's wide enough to be stable for beginners, but without sacrificing speed and control. The body board weighs 4.2 pounds only. It's a lightweight model that doesn't need any special transportation. You can fit it inside a car and you can easily carry it to the water, regardless of your fitness level. It's so convenient that even taller kids can move and ride it around with no issues at all. 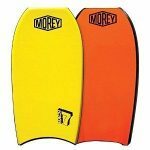 Known as one of the best body boards from Morey, this model features a Dow Core high density closed cell polyethylene core. It's one of the reasons wherefore it's so lightweight, not to mention its cost efficiency. The deck is just as important in the process. Luckily, you have a standard 8 pound TC8 polyethylene deck. While often overlooked, the bottom is responsible for the speed and maneuverability too. This unit comes with a solid high density polyethylene bottom. It's a slick design based on channels. Its strength is often given by the rod stringer, whose power reinforces the board. Last, but not least, the body board tail is a crescent model that makes maneuverability a breeze. A bodyboard size guide is essential if you're not sure what you need, while knowing your numbers can influence the final decision. This board can easily take 180 pounds in weight. It's enough for most people, including slightly overweight users. When it comes to your weight, it's ideal for people between 5.9 and 6 feet in height. Sure, you may not be able to find a perfect size for your knee-to-chin measurement, but a few differences will still provide a good experience. Better known for cost efficiency, this model from THURSO SURF is less likely to disappoint you. If properly taken care of, it can provide many years of water fun. It's built to make this sport enjoyable regardless of your skill level. Is this your first body board? It's excellent for you then! Are you more experienced than the average surfer? You'll love it! When looking for the best body boards out there, you want a full package. You want all the required accessories to go and try out your new board out of the box. It's not always the case though. With THURSO SURF's board, everything changes. Apart from the actual board, the package also includes a leash featuring double stainless steel swivels. Furthermore, you even get a luxury carry bag. Unpack the board, mount the leash, put it in the carry bag and hit the beach – simple like that. The board is 42 inches in length. It's a standard size that can easily match most adults. Even if it's not the perfect size for your certain height, it'll provide a great experience without too much hassle. At the widest point, the board is 21.5 inches. It's narrower than other similar units, so it should be easier to control. Other measurements include the tail width (17 inches) and the nose width (12 inches). As for thickness, it measures 2.125 inches. Less than 5 pounds in weight, the board is suitable for everyone. It makes no difference how strong or weak you feel – even kids can move it around. The core is based on rigid polyethylene. It's stable and easy to control. Also, it comes with 2 FRP stringers for buoyancy. They don't really add to the weight. The deck is made from high density IXPE. It's durable and properly cushioned. It measures 4 millimeters in thickness. As for the bottom, it's heat laminated. It can easily glide through water, but it will also maintain its quality standards overtime. 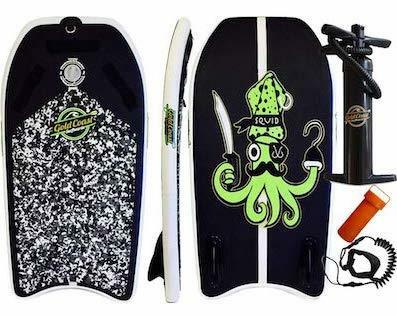 DaSupaFins comes with two major elements for a body board – high quality standards and a funky design. If you think that the shark design makes it more suitable for kids, you are wrong. It's actually designed for both grownups and children and features three different colors – blue, orange and yellow. The bodyboard dimensions depend on who you get it for. If you get it for your children or you're just really small, opt for the small size – 41.5 inches. If you're taller, get the 44 inch design. The small one is 22 inches in width – excellent for stability and speed. When it comes to its weight, it barely goes to 3.5 pounds. In other words, it's so lightweight that even children can carry it on the beach without too much effort. Sure, the shape and design might make it a bit inconvenient, but it's just part of the game. In fact, it's a patented design. The package includes more than just a basic board. In fact, you also have a deluxe leash – an accessory that many manufacturers forget about. The leash comes with a key holder too, so you won't have to worry about anything. In terms of capacity, the board can take up to 300 pounds. From this point of view, it's among the best bodyboards for big guys. It can take overweight adults, but it can also take two kids looking for some team fun. The deck is based on solid extruded polyethylene foam. It's sturdy, but also durable and slightly soft. 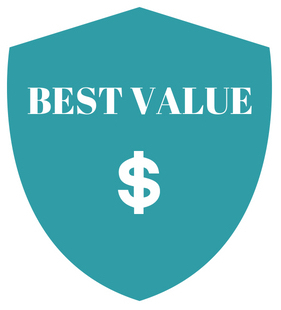 It’s among the most common materials out there, so it keeps the price low as well. The bottom carries similar properties – high density polyethylene. It also features two channels for better maneuverability and performance. The core is fitted with a graphite stringer rod. It's a boost of resilience. 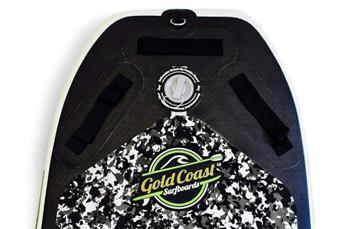 Featuring a limited year warranty and coming in two color combinations, this model from Gold Coast Surfboards can qualify as one of the best body boards for everyone, regardless of their skill level. Furthermore, it comes with some unique features that can make the difference. The board measures 42 inches in length – a standard measurement in this segment. It's 23 inches in width and 4 inches thick. It's more stable than its competition and can successfully take riders up to 250 pounds in weight – suitable for overweight users too. Despite the high capacity, the board is lightweight – lighter than pretty much any hard board out there. This model is made from double layer military grade PVC. Once inflated, it feels like a hard board, so it's extremely rigid. The top is covered in a smooth IXPE foam for decking. Once inflated, the drop stitch technology will instantly add to its stiffness. It's also worth noting that the build features holding handles, as well as pre-installed fins. When deflated, storing and transporting the board is piece of cake. It can literally go inside a backpack, so you don't need any special adjustments to take it to the beach. 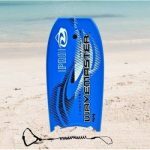 Apart from the inflatable body board, the package also includes a hand pump, a roll up strap, a quick repair kit and an IBB package carrying case. The hand pump might feel a bit exhausting when inflating the board though, but it'll get the job done. As for extras, the board features thick rounded rails for both performance and buoyancy. BeachMall doesn't fool around when it comes to satisfying its customers' needs. It is longer than most body boards and comes with the leash. It is powerful enough to withstand 250 pounds in weight. This model measures 44 inches in length. It's slightly longer than other units in this range, so it's faster and easier to control. At the widest part, the board measures 23.5 inches. Its tail is 19.5 inches in width, while the nose goes up to 13 inches. In terms of thickness, it measures 2.75 thickness. Weighing around 2.5 pounds, anyone can carry it around, including your kids. The core is made from high density closed cell foam. It features strong polymeric chains. In other words, it’s suitable for any kind of water – both cool and warm. The top is covered in a polyethylene skin. It has a unique heat seal preventing the water from affecting the core. Apart from being water resistant, it's also durable and compact. Other than that, riders will love the grip rails for stability and security. BeachMall's board can take riders up to 250 pounds in weight. It's one of the few hard boards with such a high capacity. It's suitable for both light and overweight users. The package comes with a feature that many manufacturers overlook – the leash. The wrist leash is essential to prevent losing the board, but also to keep it nearby. If you don't have one, you'll have to buy it separately. Not anymore! The one in this package is 34 inches in length, so it also provides some movement flexibility. 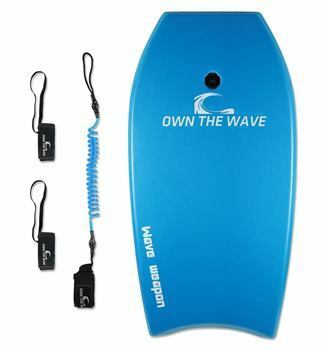 Own The Wave has designed one of the best body boards on the market by targeting an often overlooked segment – children. The board is available in over 10 different designs, only to satisfy even the pickiest customers. The board is available in three sizes – 33, 37 and 41 inches. The size should be chosen based on the distance between your kid's knees and chin. It has an ergonomic shape and it's slightly wider than boards for adults. The ratio is ideal for children, as they require some extra stability, rather than fast speeds. Weighing a few pounds, the board is easy to carry around. Children will have no problems taking it to the water. Despite being designed for children, the board features a professional build that leaves no room for mistakes. The EPS core is durable and compact, but also lightweight. Also, you have a high speed slick bottom surface, which compensates for the extra width. The rear bottom comes with a few channels for a higher performance, as well as a crescent tail to help kids maintain the direction. Just like boards for grownups, this model comes with its own leash. It's excellent to ensure your little one won't lose it in the water. A set of fin tethers is also included, so your child is less likely to lose the fins in the waves. According to the manufacturer, these premium features are wrapped in a tight bundle underneath the plastic wrapping, so open up everything before throwing the packaging away. Known as one of the best bodyboards brands, BPS has designed some of the best body boards on the market in terms of cost efficiency and durability. Judging by the plethora of reviews out there, this model makes no exception either. The STORM model comes in four color combinations, with blue and purple being the most popular one. The board is mostly recommended to children and small adults. It comes in three different sizes – 33, 37 and 41 inches. It weighs a few pounds, so it's less likely to cause any trouble on the beach. Given the size, you'll probably be able to transport it on the backseat of your car. Once on the beach, even your kid can take it out and carry it to the water. 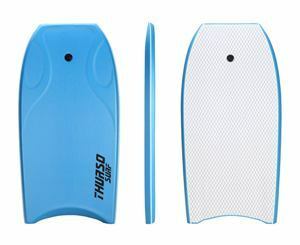 Unlike many body boards that come with no extra accessories, this one features everything you need to use it at full efficiency out of the box. The leash is a must, especially if you buy it for a kid. You don't want them to lose the board in water. The same goes for the fin tethers. When it comes to body boards, kids often fail to look after them. They usually lose the swim fins in the waves – not anymore! Tethers ensure that everything stays together. According to the manufacturer, these extras are tightly packaged underneath the board wrapping, so don't overlook them by mistake. Given the materials and build, this is one of the best body boards for youngsters. If you thought the quality is important for adults only, you were wrong. This board comes with a strong EPS core, as well as bottom rear channels. Their main role is to increase performance. The same goes for the crescent tail. Don't overlook the slick bottom either, which will add to the speed. Maintenance is fairly simple and doesn't require too much work. When left in the sun, make sure the board faces the sun with the white side. It's important for both its design and durability. 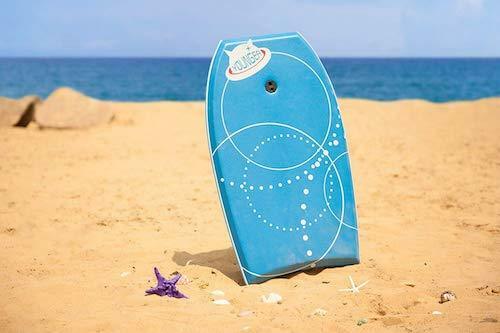 California Board Company has gained notoriety by designing some of the best body boards – simplicity with a dash of professional features. This one makes no exception – it's built to last and benefits from some modern technologies. 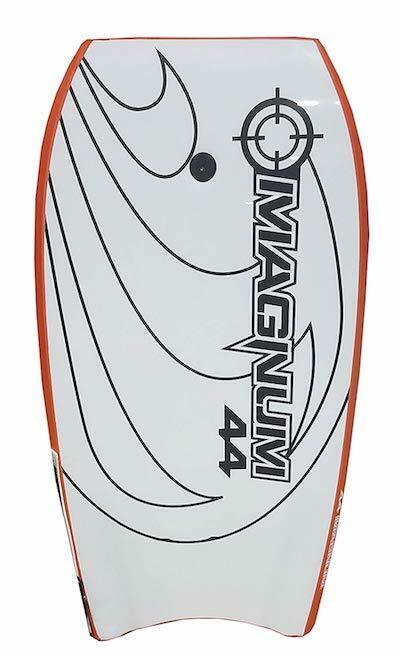 The contour is one of the first things to draw some attention when you check this body board out. It has a molded contour deck, which is obviously designed to increase the comfort. Arm wells on the surface are just as handy, as you can actually benefit from a locked fit – stable and less likely to slip. The core is based on waterproof expanded polystyrene. It will successfully face the test of time. As for the bottom, it's slick and likely to add to your speed. It's made from high density polyethylene and features a few channels. Comfort is a must when riding a body board. That's why the best body boards try to lock your position in. Apart from the wells on the contour deck, the board also has a crescent tail design. It adds to your convenience when facing waves, but it also increases your control. The superior control is given by the deck too. When your whole body is locked in, you don't have to worry about slipping away, so all your energy is directed towards things that really matter – control and speed. Don't overlook the thumb bulbs either. In terms of sizing, this model comes in one option only. It measures 44 inches in length and 23 inches in width. It's also 2.75 inches thick. It's slightly longer than other boards for grownups in this range. In other words, it can also take riders taller than 6 feet. Weighing around 3 pounds only, you'll have no problems carrying it to and out of the water. When hunting the best body boards on the market, you clearly want to know what comes in the package too. The leash is a must, yet many manufacturers overlook it – not California Board Company though. You have a dual swivel coil wrist leash to keep the board next to you regardless of how aggressive the waves are. 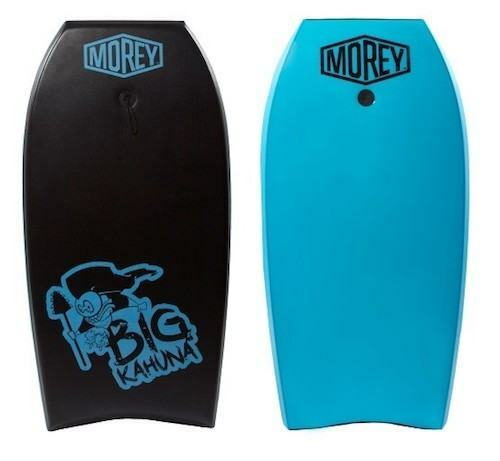 Morey's Big Kahuna body board is specifically designed for larger and taller users, hence its slightly larger size and extra capacity. It's available in three colors – blue, black and red. The board is 44 inches in length. In other words, it makes a good choice for those taller than 6 feet. All in all, it's rated to be perfect for everyone over 5.1 feet in height. It's suitable for large overweight users as well, since it can take up to 200 pounds of weight – a bit more if the rider is experienced. Despite the extra length, the board is only 22 inches in width. It's not as stable as other boards, yet it's faster and much easier to control. The board is based on a strong polyethylene Dow core. It's water resistant and despite being sturdy and stiff, it's also lightweight. The 8 pound IXL deck measures 4 millimeters in thickness and feels soft. As for the bottom, you have graduated channels for a higher speed and easier control. The speed is also underlined by the contour of this boat. It has a crescent shaped tail, which will add to its speed. The power rod stringer shouldn't be overlooked either. In terms of comfort, the extra length can support taller and heavier guys, without having parts of their bodies out of the contour. The overall contour also makes the control fairly simple, so you won't have to struggle. Maintenance is simple and doesn't imply too much work. Simply avoid storing the body board in direct sunlight for ages. Sure, you can do that when you're on the beach, but don't store it for days under the sun. Coming in five different colors and with a great value for money, this model from Younger is among the best for two categories of people – beginners and children. The board is 33 inches in length. It's way smaller than average boards for adults in this segment. However, apart from being recommended to children, it's also suitable for beginners. It's available in bright and visible colors – yellow, red, rose red, green and blue. The package is not too diversified, but it includes the most important accessory for this sport – a leash. The leash carries the Pro Quality standards. It has a wristband and will keep the board nearby when waves take you down. Given its small profile, it's likely to be taken away really fast, hence the necessity of a leash. The EPS core leaves no room for mistakes – water resistant, durable and stiff. It feels more rigid than in other similar boards. The slick bottom is based on high density polyethylene. It also features a few channels and a crescent tail. In other words, you got both speed and control. The IXPE deck is comfortable and slightly soft, yet it won't affect its performance. The heat lamination technology used in the manufacturing process increases the durability of the board and its impact strength. Apart from feeling compact, the board comes with 60/40 rails. Their main role is to increase the maneuverability and stability, not to mention skills and tricks. It's worth mentioning the leash, which some companies tend to forget about. When dealing with something so lightweight or a product designed for children, you don't want it to lose it right away. Sizing is the most significant consideration when looking for body boards. It will inevitably affect your entire experience. You'll have to analyze both the weight and height. Even one inch the wrong way can ruin your venture and take all the fun away. The ideal size is easy to measure. When held vertically in front of your body, the board should go between the knees and chin. If you buy online, just measure this distance manually. You'll then know what to look for. If you're heavy, you might want to opt for extra width for stability and buoyancy. How experienced are you with water sports? Have you used a body board before? Are you an experienced user or just a complete newbie? Generally speaking, you'll get what you pay for. Being honest to yourself is imperative. Just because you purchase the most expensive and best rated board on the market, it doesn't mean you'll become a world champion within the next weeks. If you skip the basics, you won't enjoy it. Many beginners make this mistake. They invest in high end features that they have no use for. Why? Easy! They lack the experience to do so. Polyethylene (PE) is the main type of foam used in the core of body boards. It's excellent for cool waters. It provides plenty of flex, so you gain some extra control. On the other hand, polypropylene (PP) has gained more notoriety among professionals. It comes with greater speeds, as well as strength and a light profile. It's great on warm waters. Although PP boards look appealing, using them in cool waters will make them feel stiff. You'll lose control and gain an extra challenge in the attempt to enjoy the sport. Professionals use them for the manufacturing procedure, which adds to their density and consistency. If not sure which one's right for you, try both from a local renting shop. However, this decision should be made with the climate and temperatures in mind. PE decks are soft and generally come with an 8 pound density. They're flexible, but they're less likely to maintain their shape for too long. That's the main reason wherefore they're said to be fragile. The crosslink alternative comes with a 6 pound cell structure. It's more durable, but it's also stiffer and less comfortable. 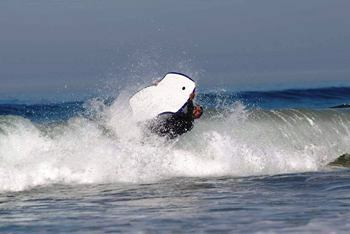 The actual contour of a body board will affect the control and response. A well shaped board will give you a better grip, but also some comfort. For this reason, the contour should never be overlooked. If you're new to this sport, you might want a body board that is wide enough for you to put your elbows and hands on it in the right place. When you gain experience, you can adjust and be more flexible. 1. What is the right size for me? Ideally, you should stand with the board next to you. The top should measure by your chin, while the bottom should be by your knees. Other experts recommend having the board in front of you and making sure it goes just below the waist. 2. What about the ideal width? It's highly recommended to get a body board with the widest point about halfway through it. When you lie down, the board will turn from the area under your elbows. When the widest point is close to the middle, the board is just more stable, especially when you knee. The width does matter – extra width makes the board more stable, but it sacrifices control and speed. 3. Do body boards come with a rocker? Some models might, indeed, feature a rocker. Put the board flat on the floor and you'll see if there's a curve. Generally speaking, most manufacturers rely on relatively flat boards because they're good for small and medium waves. Body boards with rockers are more suitable for big waves. 4. 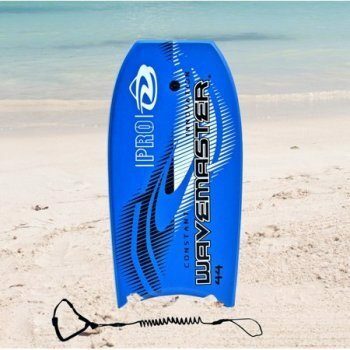 Should I buy a body board with channels? Channels represent some deep contours on the bottom. In other words, the water can channel under the unit. Water channeling is excellent for big waves. However, many manufacturers try to make their boards as diversified as possible, so you'll find many simple models with channels. As a short final conclusion, analyzing the best body boards out there will actually take a while. One thing is for sure – you'll have to assess your necessities first. Once you know your size and your expectations, making a final decision is much easier. Sure, there will be more models to match your needs, but then, go for the most appealing one in terms of design and style. The above mentioned units are extremely well rated and dominate the market, so you can't go wrong. 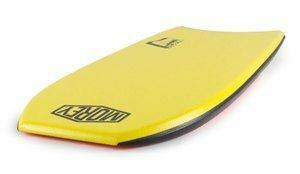 However, one body board stands up in the crowd though – Morey Mach 7 Bodyboard. It's the top rated model for adults and has a little of everything. This body board is very light, weighs 4.2 pounds only.